To make your reservation, please ensure all the required fields on both the booking form and the credit card information form are completed. Upon receiving your deposit we will send you a confirmation package by email, including pre-departure information pertaining to such things as visa information (if applicable), recommended items to pack, a suggested reading list, and general information to prepare for your trip. Your air e-tickets (if applicable), hotel list, and final trip details will be sent by email about 2 weeks prior to departure. 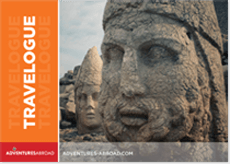 If you have any questions or are having trouble with this form, please e-mail sales@adventures-abroad.com or call us on 1-800-665-3998, Monday-Friday 9:00am-5:00pm Pacific Time. To review our complete booking terms and conditions, click here.